The proposed rezoning for the station area. Click on the image to see a PDF that contains a larger map. The Department of Planning and Development (DPD) is holding a public hearing on Wednesday, February 29 to discuss proposed rezoning in the North Beacon Hill urban village area, in order to implement the updated North Beacon Hill neighborhood plan. (See Seattle Council Bill 117375, currently in committee.) 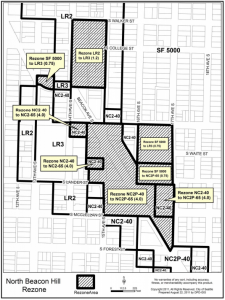 The proposed rezones may be seen in this PDF, and include rezoning several 40′ zones to 65′, changing parts of the El Centro properties from Single Family 5000′ to Neighborhood Commercial or Low-Rise zones, and changing some other areas to Low-Rise 3. Additionally, there would be a slight expansion of the Beacon Hill Station Overlay District. The public hearing, which will be combined with a similar hearing for the Othello Neighborhood Plan update, will be held on Wednesday, February 29 at 6 p.m. at the NewHolly Gathering Hall, 7054 32nd Ave. S.
If you are unable to attend but still wish to comment, you may send comments to Councilmember Richard Conlin, richard.conlin@seattle.gov. Comments should be received by Tuesday, February 28, at 5 p.m.
Well, there are of course quality of life issues for the neighborhood, but, for people really interested in the environment, cramming as many people as possible as close to each mass transit station as possible is really the way to go. Just my opinion and I live in between two of these transit station zoning districts and not in one, but I think someone needs to state the obvious that having a transit station surrounded by mostly single family housing is not an ecologically friendly zoning plan. Hear Hear Paul. I personally think this isn’t nearly aggressive enough. I live within this rezone and would love to see much more extensive 65′ areas. This will make the neighborhood more vibrant because it will be able to support more local businesses. Also, just because the zoning changes doesn’t mean the neighborhood will change overnight. Single family homes will remain for years before development happens. So folks who live in those homes now don’t necessarily have to be concerned about their situation changing immediately.